train are the uniformed conductor and brakeman wearing the Ku Klux Klan headdress. 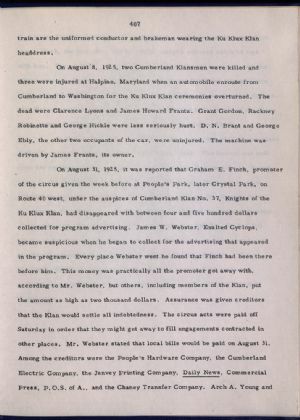 On August 8, 1925, two Cumberland Klansmen were killed and three were injured at Halpine, Maryland when an automobile enroute from Cumberland to Washington for the Ku Klux Klan ceremonies overturned. The dead were Clarence Lyons and James Howard Frantz. Grant Gordon, Rackney Robinette and George Hickle were less seriously hurt. D. N. Brant and George Ebly, the other two occupants of the car, were uninjured. The machine was driven by James Frantz, its owner.